Your flooring choice often sets the tone for a room. We know our customers want the best look for the best price without sacrificing durability or dependability. At Macadam Floor and Design in Portland, Oregon, we’ve been helping clients create the floors they love for over 30 years. Our extensive vinyl flooring inventory offers resilient, budget-friendly options residential and commercial customers can count on. Vinyl flooring is a synthetic man-made material. It’s a type of plastic primarily composed of colored polyvinyl chloride (PVC) and comes in sheets, tiles or planks with four layers. These layers typically include a clear protective top layer, an embossed layer, PVC core and PVC backing. 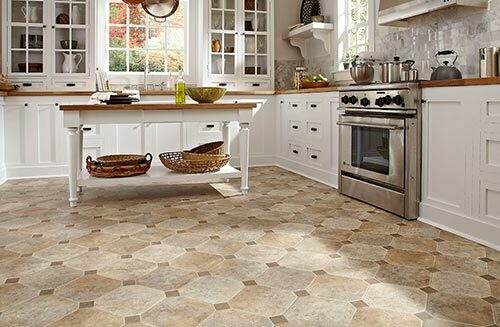 Vinyl flooring has regained popularity and is one of the least expensive flooring options, available in a wide range of colors, styles and designs that can mimic more expensive options like wood and natural stone. Vinyl has a low cost-per-square foot advantage that makes it an ideal option for homeowners on a limited budget or business owners with large commercial spaces. Plus, new manufacturing techniques ensure your floors won’t look cheap like vinyl floors of the past. Vinyl flooring is impossible to beat on moisture resistance, especially vinyl sheet flooring, which can be installed in any room in your home. This includes rooms with moisture issues like kitchens, bathrooms and laundry rooms, that other flooring choices can’t withstand. Vinyl sheet flooring is one of the few flooring materials that’s not just water-resistant, it’s waterproof. Vinyl flooring can last 10 to 20 years and is an excellent choice for high-traffic areas because it doesn’t easily scratch, dent, stain or fade. For even more durability, choose fiberglass-reinforced options. We offer a huge selection of vinyl flooring with nearly endless customization options. We can help you create the design you want from traditional to stone or hardwood replication. We carry some of the finest quality brands, including Armstrong, Flextec, Mannington, Congoleum and IVC. All our employees at Macadam Floor and Design are friendly, knowledgeable and provide outstanding customer service. We take pride in making sure each of our customers has a wonderful experience from start to finish. Our design team can help you find the vinyl flooring to match the look you want, even when you’re on a tight budget. Contact us at 503-246-9800 to get started on your floors today!